Alaska is available in a wide choice of superb quality leathers - black, waxy brown, dark brown, navy blue and tan milled. The photos show Alaska from various angles in black. The brown variants have the brown sole as shown. The style also looks great in bordeaux, purple or red suede. Lengthy research has been rewarded by us finding an excellent quality fleecy lining material, one which promises comfort and warmth as well as looking great. 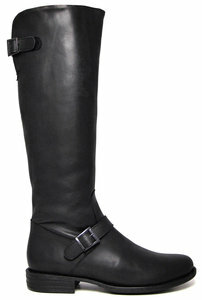 The lining is used throughout the shaft of the boot and even the insole and toe are fully lined. The comfortable and durable sole unit is rubberised with a textured 'grip' panel. We have incorporated an inner zip to ensure the boot is easy to put on. The open top and adjustable strap allows us to supply a taller boot - up to 44 cms. Measure both calves at the widest point. If you intend to wear your boots over thick tights, trousers or jeans then measure your legs wearing them. Our craftsmen cut accurately so there is no need to “add for safety”. Your calves may have slightly different measurements, as long as the difference is one cm or less we suggest using the smaller of the measurements – we use very soft leathers which will give in wear. Furthermore there is a hidden stretch panel or adjustable strap designed into all our boots. If the difference in your calves is more than two cms for an extra charge we can make each boot a different size, call or email us and we will get back to you. For slimmer calves the measurement should be taken around the bone of your ankle. For slim legs your ankle measurement may be below the minimum option shown, making the ankle smaller spoils shape and can make it difficult to get the boot on your foot so choose the minimum option shown. For calves 40 cms and more take the measurement at the ankle bone and 7 cms above the ankle bone - use the larger of the two measurements for your order. If you have swollen ankles or lower calves please take the measurement a little higher to ensure a comfortable fit at the ankle and lower calf. We find for most customers and styles the best boot shape is achieved if the boot finishes about 3 or 4 cms below the crook of your knee. There is a strong correlation between your foot and calf sizes and height. For larger calves (40 cms plus) best boot height in cms is within one cm of the European foot size i.e. if you have an European foot size 39 the best height for most customers will be between 38 and 40 cms. For those with slim calves heights tend to be more than foot size. Everyone is different and may want a different look, if you have any doubts just email and we'll get back to you immediately - what's the best height for me? Measure the circumference at the point where the boots will finish. This point, the boot height, is usually about 3 to 4 cms below the knee. This measurement is used as a guideline to be able to tailor your boots around your legs. Now you have your measurements you can choose your style and colour.